It seems anytime I review how to tell time with my kids, they get it and feel confident. Then when we try again a little later, it’s as if they’ve forgotten everything they knew. 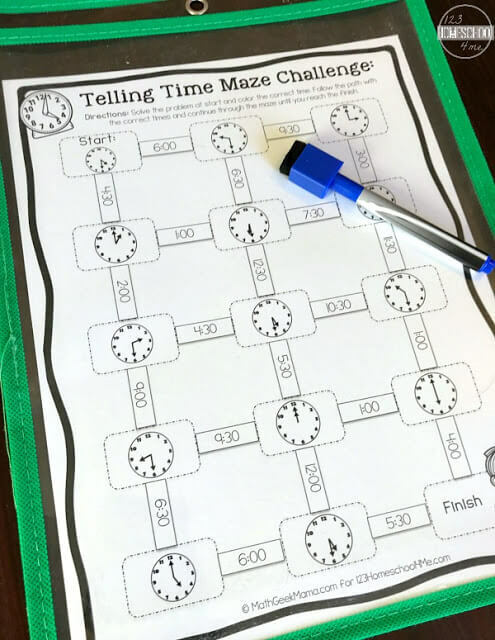 If your kids are learning to tell time for the first time, or just in need of review, these telling time mazes are perfect! 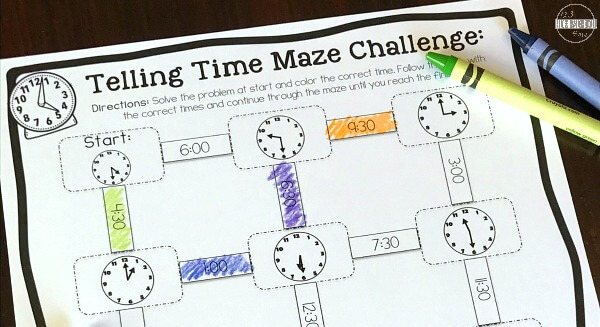 Kids will love these FREE Telling Time Mazes because they are more fun than just a typical worksheet, it is a FUN activity to practice using a clock. 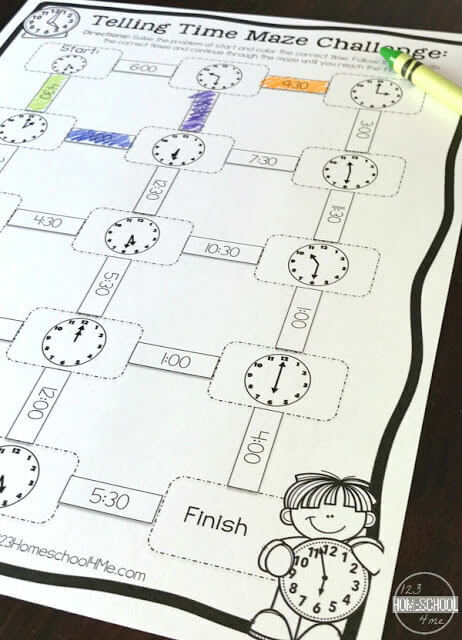 Plus, this clock activity is self-checking: they’ll know they missed something if they don’t make it to the finish! And you will love how simple and low-prep they are to use. Just print and go! Plus, you can easily differentiate for different ages or abilities with the different levels of puzzles. There are 3 different mazes in the download below. The first only includes clocks with time to the hour. The second maze includes time to the hour and half hour. The last maze includes time to the hour, half hour and quarter hour. An answer key for each maze is also included. Hopefully solving this math maze is pretty straightforward. Starting at the top, in the start box, kids determine the time shown on the clock. They then find the path with the correct matching time and color it, leading to another box with a new clock. They then determine the time shown on that clock and repeat the process until they successfully navigate to the finish. These are black and white for easy printing, but if you’re looking for an easy review that you can pull out again and again (this would be a great math challenge for younger kids while you’re helping the older ones) simply print each page and place them in plastic sleeves. 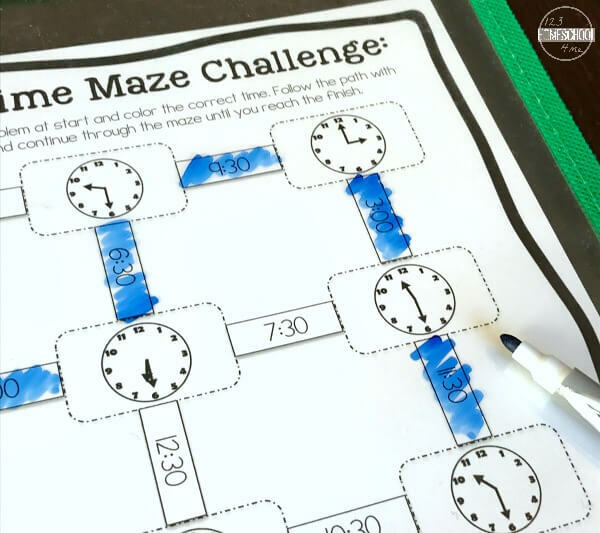 Then set your kids up with a dry erase marker and let them work their way through the maze. Then erase them to pull out again another day. 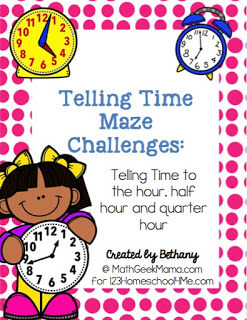 Another great and easy telling time review activity is this set of telling time puzzles. Once you print and cut them out, you can simply pull them out for your child to work on independently anytime you need a quick review of how to tell time.